This is a rarity: I'm posting this almost immediately after eating. Tonight called for a rather quick meal and here it was. 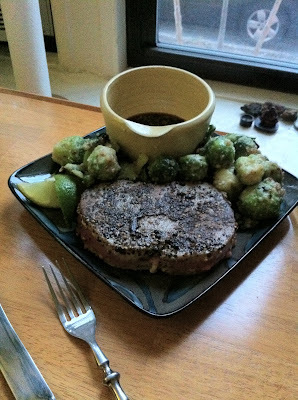 A tuna steak au poivre and spicy brussels sprouts with parmesan were called for; easy to make in a half hour. I'd recommend a spice grinder for the tuna spices, but other than that this came out fantastic! You can find the tuna recipe here and the brussels sprouts one here. Note that I love brussels sprouts, but I know that one is a bomb. Your soundtrack for this entry: Trivium - In Waves.